Just as my friends influenced my life, you can bring the light of the gospel to your friends’ lives by the way you live. Recently I visited with a friend I knew in high school. We talked about when we first met, about the joy that comes from living the gospel, and about the influence friends can have on our lives. In fact, it was because of the example of my friends that I joined the Church. I first came to the United States from American Samoa when I was 10 because my father wanted his children to have more educational opportunities than those he had. I lived in Seattle, Washington, with an aunt and uncle. At 14, I moved to California. My grandmother, with whom I lived, was a temple worker in the Los Angeles California Temple, but I was not a member of the Church. During my junior year of high school, I became involved with student government and noticed several people on the student council who stood out from all the rest. They were respectful of others, clean in speech and dress, and had a dignity and light about them that caught my attention. We became friends, and they invited me to go to Mutual with them. I liked the fun, wholesome activities and the Spirit that I felt there, so I began attending regularly. Just a few weeks later my friends introduced me to the missionaries and to the Book of Mormon. I was baptized soon afterward and began a lifelong study of the Book of Mormon. My friends followed the counsel found in 1 Timothy 4:12: “Be thou an example of the believers, in word, in conversation, in charity, in spirit, in faith, in purity.” Like my friends, we can be an influence for good by our day-to-day actions of living the gospel. As we live our lives to reflect our standards and beliefs, those who are prepared to receive the gospel will notice and want to know more. For example, remember the story of Alma found in the Book of Mormon. 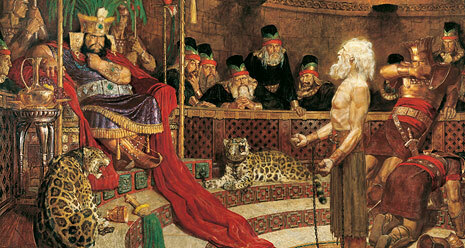 Alma was living a comfortable life as a priest in the court of King Noah. When Abinadi bore his testimony, Alma believed him and, with great danger to himself, wrote down Abinadi’s words and taught others about the Savior (see Mosiah 17:2–4). “And it came to pass after many days there were a goodly number gathered together at the place of Mormon, to hear the words of Alma. Yea, all were gathered together that believed on his word, to hear him. And he did teach them, and did preach unto them repentance, and redemption, and faith on the Lord” (Mosiah 18:7; see also verses 1–6). Later, when Alma the Younger was causing problems for the Church, an angel answered Alma’s prayers: “The Lord hath heard the prayers of his people, and also the prayers of his servant, Alma, who is thy father; for he has prayed with much faith concerning thee that thou mightest be brought to the knowledge of the truth” (Mosiah 27:14). Alma the Younger and his friends repented, became great missionaries, and touched the lives of thousands by their example for good. “And thus they were instruments in the hands of God in bringing many to the knowledge of the truth, yea, to the knowledge of their Redeemer. “And how blessed are they! For they did publish peace; they did publish good tidings of good; and they did declare unto the people that the Lord reigneth” (Mosiah 27:36–37). My friends also set a good example for me when they chose to serve missions. Although I faced some opposition, I decided I also wanted to serve a mission. That decision has shaped the rest of my life. When I served in the Samoa Apia Mission, the missionaries carried much of the priesthood leadership responsibilities, and I could see that the Church in the islands needed to be strengthened. I made up my mind to do my part﻿—I would return to Samoa after finishing my mission and my education. After graduation from college, my wife and I moved to Samoa, where we raised our children and worked to strengthen the Church and the community. My father, not a member of the Church, was actively involved in local business and community affairs. His motto was “If it’s worth doing, it’s worth doing right.” As my siblings and I discovered the gospel and lived it to the best of our abilities, he noticed the changes for good in our lives. In 2000, President Gordon B. Hinckley (1910–2008) stayed in my father’s home on his return from the dedication of the Suva Fiji Temple. During that visit, the Spirit touched my father’s heart, and I was privileged to baptize him when he was 82 years old. He found great joy in the gospel and was unashamed and bold in sharing it with others during the last days of his life. I know the importance of being an example of the believers and the happiness it brings into our lives and the lives of others. Because of my friends’ good examples and the love of a prophet, my family and I have been blessed with the joy the gospel brings. Every day we influence others by our actions. Let us be sure to reach out to others and share the truth of this scripture that it may bring happiness to their lives too: “Remember, remember that it is upon the rock of our Redeemer, who is Christ, the Son of God, that ye must build your foundation; that when the devil shall send forth his mighty winds, yea, his shafts in the whirlwind, yea, when all his hail and his mighty storm shall beat upon you, it shall have no power over you to drag you down to the gulf of misery and endless wo, because of the rock upon which ye are built, which is a sure foundation, a foundation whereon if men build they cannot fall” (Helaman 5:12). Alma the Younger and his friends became great missionaries and touched the lives of thousands by their example for good.